If you have not already identified your skin type and the products best to use, click here to shop by your skin type. You can customize your skin care routine according to your specific needs by choosing products from multiple categories. Apply 4-6 pumps of cleansing oil to damp skin and massage into the face and neck for two minutes. Remove with a warm, wet facial cloth. 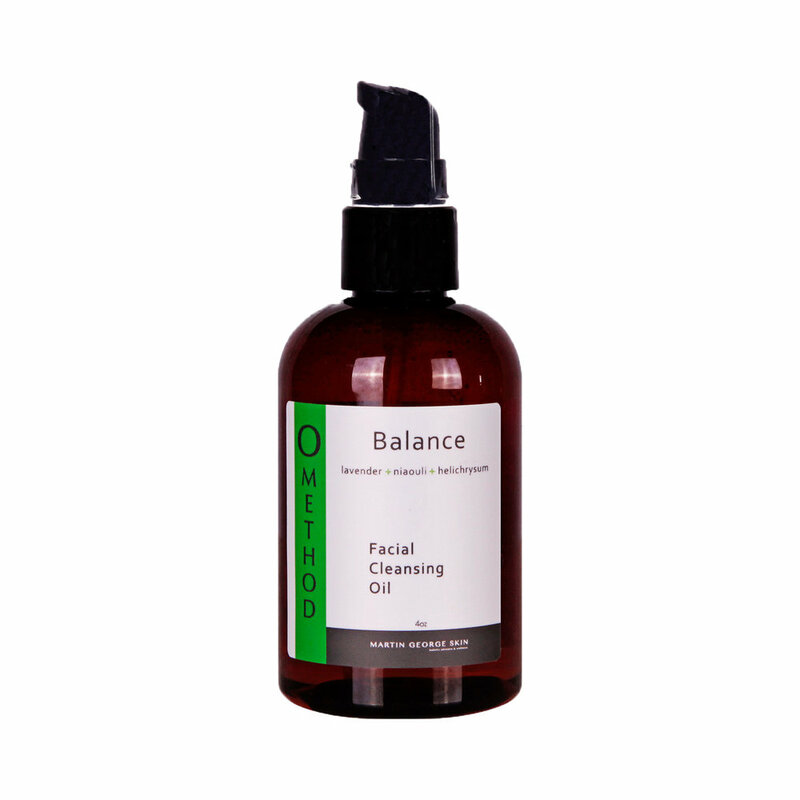 Cleansing oil should be used morning and night with an additional cleanse for makeup removal. Use Omethod Facial Cleansing Scrub on top of your daily cleansing oil, three to five times per week, depending upon your skin type and needs. Gently massage one teaspoon into the face and neck, smoothing away texture and congestion while stimulating cellular renewal. Massage for one to two minutes and remove both cleansers with a warm, wet facial cloth. Each person will have an individual and varied need for exfoliation. More sensitive skin types may require less frequent exfoliation, while more oil productive skin types may require frequent exfoliations. Toner provides the opportunity for water based ingredients that are beneficial for the skin to be absorbed and utilized. They exercise tissues, are antiseptic and astringent, providing the hydrophilic ingredients for proper barrier function, while prepping the skin for better absorption of your moisturizer. Morning and evening, spray three to five pumps of toner into the palm of your hand and rub hands together. Gently press into the face and neck until just before skin becomes dry and follow with the treatment moisturizer most appropriate for your skin’s needs. Apply 3-5 pumps of treatment oil/cream to the face and neck in the morning, following facial toner. It is not necessary to apply this at night during your skin care routine because the skin functions in two capacities. During the day the skin acts as a protective organ and during the night it functions as an eliminatory organ, eliminating waste products that ultimately benefit the skin as a whole. Using night creams and heavy products in the evening subdue the skins natural functions leading to many of the problems that skin care products seek to correct. It’s best to allow the skin to rest in the evening and perform its natural functions. As an alternative to heavy lotions and creams, “MGS Bloom Oil” can be applied in small amounts to provide extra moisture if needed. Any skin type benefits from a weekly masking with Pore Refining Clay Mask. This product addresses individual needs regardless of specific issues, ie – hyperpigmentation, pore minimizing, extracting impurities, acne, skin congestion, inflammation, and increasing the cell cycle to promote healthier functioning, youthful, smooth textured skin. Encouraging healthy, vibrant skin by exfoliating the upper layers of the tissue to encourage the under laying cells regeneration in their natural cycle. It is ideal to follow this mask with the Nourishing Gel Mask or Restoring Cream Mask, as the Clay Mask preps the skin for optimal absorbtion. A weekly cooling, anti-inflammatory mask that nourishes and astringes the skin while evening skin tone and improving skin health. Apply two teaspoons to face and neck, leave on for ten to thirty minutes, and rinse with warm water to remove. A weekly rich and emollient mask that restores vitality and hydration to all skin types. This mask is high in anti-aging antioxidants, trace minerals and protective butters. Apply two teaspoons to face and neck, leave on for ten to thirty minutes, and rinse with warm water to remove.